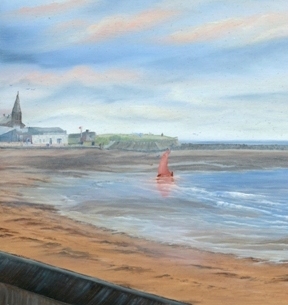 An original, signed, oil painting on canvas board of Newbiggn Bay. Measurements are 24 x 64cm including frame. 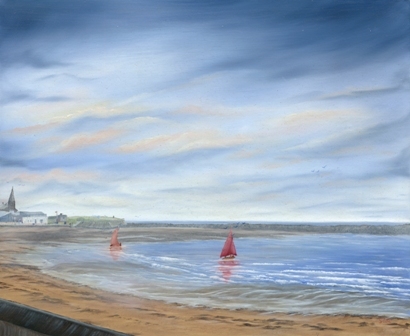 An oil painting of a local beauty spot, Newbiggin bay, in Northumberland. 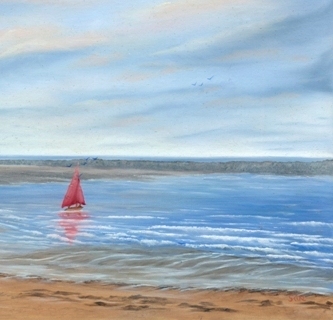 Showing the gentle curve of the bay and beach as two sailing boats set out onto the water, beneath a lovely , gentle, summer sky. The church can be seen at "Church Point" overlooking the Maritime Centre and cafe. a popular place for a cuppa and a cake. Framed in a light wood effect frame.